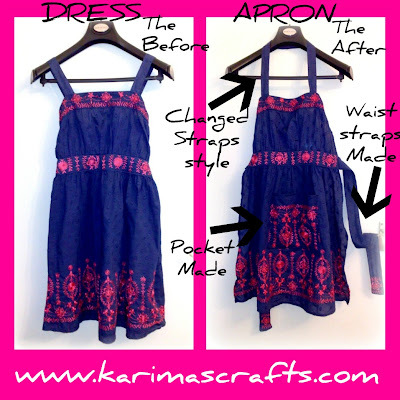 The photo above shows a project of a dress I turned into an apron. It was an excellent design to make into an apron for a family friend of mine. 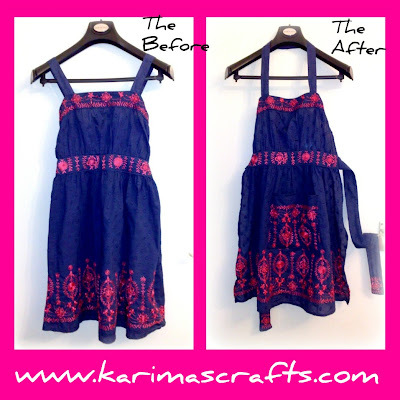 Aprons are one of my easiest and most preferable projects for upcycling clothes. Step 3: The neck straps of the dress were sewn together to make one strap to go over the neck. Step 4: Make waist straps from the spare fabric (back of dress) and sew the straps to the apron. Step 5: Make a pocket from the spare fabric and sew to the apron skirt. 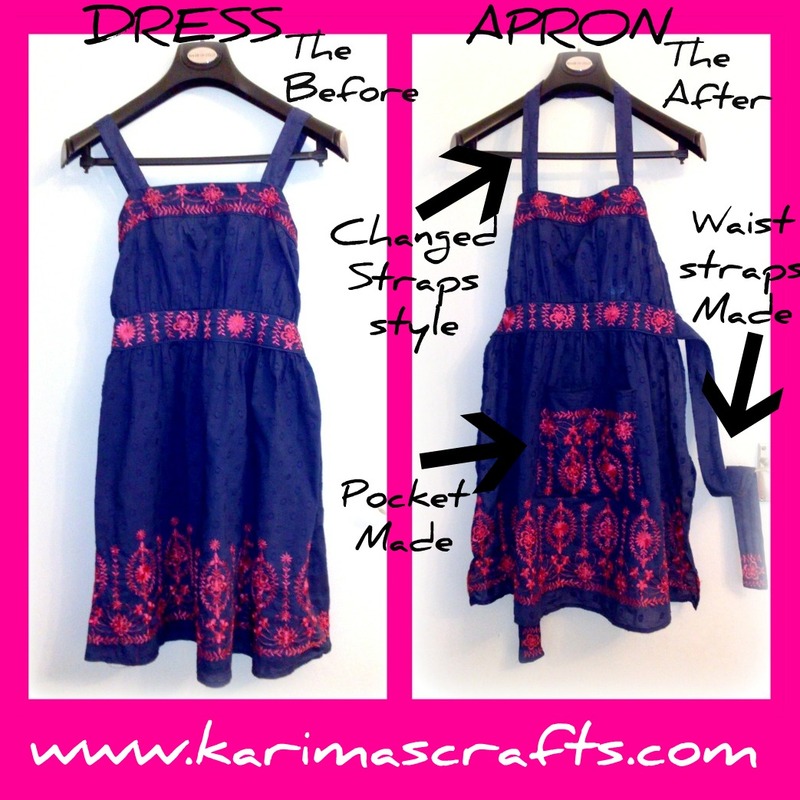 The style of the dress makes a difference when making aprons. I look at dresses that normally have a wide waistband and that have shoulder straps (not sleeves). Also if a dress already has long straps at the waist for tying in a bow at the back this saves making your own waist straps. I normally sew my own straps if I have enough matching fabric, however straps can be bought in many fabric shops by the metre.The photo I have used for this blog was of one of the dresses that makes this task so quick and easy. The graphic photo below highlights the areas that I altered. The photograph below shows an apron I made for my sister using the same technique. Her husband in the photograph is also wearing one of my creations, a simple black apron which I added a funky pocket to and also personalised for him. Why not give it a go, with the right kind of dress it can be so easy! Other dresses can also be transformed, it just takes a lot longer to do. wow, what a cool blog with so many goodies! Blog hopping, hope you can follow me back! Oh I just love this project! I did the same thing to make myself an apron over the summer and I just adore the results! Thanks so much for sharing with the Pink Hippo party.. can't wait to see what you share next! That was a good work. Thanks for following me, I'm following you too. Hope we meet again, in the virtual world. Very pretty new use for a sundress! Thanks for linking to Wicked Awesome Wednesday! Karima, following you now, thanks for following ME!! 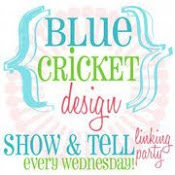 How do you get all of your link party/blog hop buttons above so TINY??? FYI: Hippos have always been my favorite animal!! I went to Africa on my honeymoon, just to see them in the wild!! Danielle - I too have made aprons from skirts. HandyMan Crafty Woman - I look forward to your linky parties thanks for commenting. Bonie - thanks for being one of my newest followers, much appreciated. Sorry Bonnie I spelt your name wrong - typo error! This is EXACTLY the tut that I needed, thanks! Too cute! Linking up from the Weekend Blog Hop! I was looking at your sewing projects. Your daughters are adorable! I was eyeing the 10 minute headband and I might try that for my 4 year old niece as a Christmas or Birthday gift. Do you have problems with your daughter complaining about tightness with the headband or it hurting her head? KIM - I am glad you found this post useful. Tina - My eldest daughter loves wearing headbands, if my daughter is beside me I make sure that they fit before I do the finishing stitches so they are not too tight! It may help to copy the size from a headband you already know that fits. Hi Karima! I just stumbled onto you blog. What a great site you have!! I am now your newest follower; and I hope you will follow back! Blessings to you! What a great idea for upcycling dresses. This one is very pretty! I REALLY like this idea, what a great upcycle! What a terrific upcycle! It's adorable! 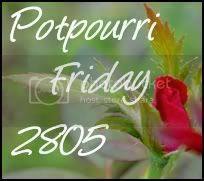 Thank you for participation in Potpourri Friday. You have certainly made it more fun!